Not only do I have the 7" single of 'Can't stop running', I've also got the 12" single. This contains an extended remix of the song, entitled the 'Powerblast mix'. It's not the most stunning remix ever, but it's a longer version of this very energetic Eighties track, and that's good enough for me. I have no further records of Space Monkey, but the career of this one man band (Paul Goodchild being the only member) was rather short anyway. Space Monkey was a British pop group from the mid-1980s led by singer, songwriter and guitarist Paul Goodchild. 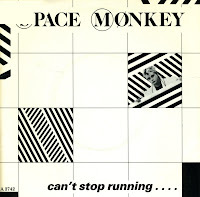 They released 'Can't stop running' in the autumn of 1983. While it only reached number 53 in the UK, the single peaked at number 12 in the Dutch Top 40. I was listening to the top 40 every week during that time, so that is how I got to know the track. According to Wikipedia, the group also released an album in 1985, called 'On the Beam'. Space Monkey was not a 'group' per se; Goodchild was in fact the only person to appear on every one of the tracks on 'On the Beam'. Various session musicians were utilized. 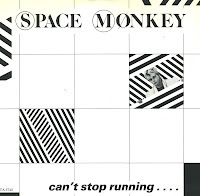 The album failed to make any chart impact, and Space Monkey ceased to exist soon after that.